Give the party people something to talk about when they see you in this sweet looking brown crocodile print Italian cut blazer made by Zacchi. Featuring side vents and a single breasted 2 button style. This blazer is born to have you looking the best in the club. 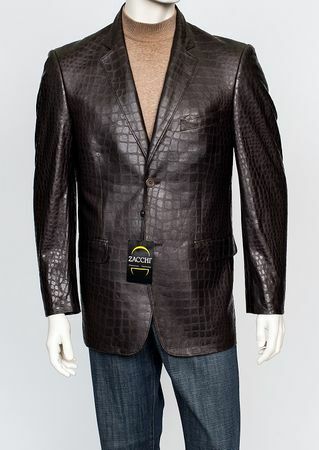 Made of brown crocodile print microfiber, the fabric feels like a very soft glove type leather and you'll love the way you look wearing this fashion blazer that has that classic Italian cut.